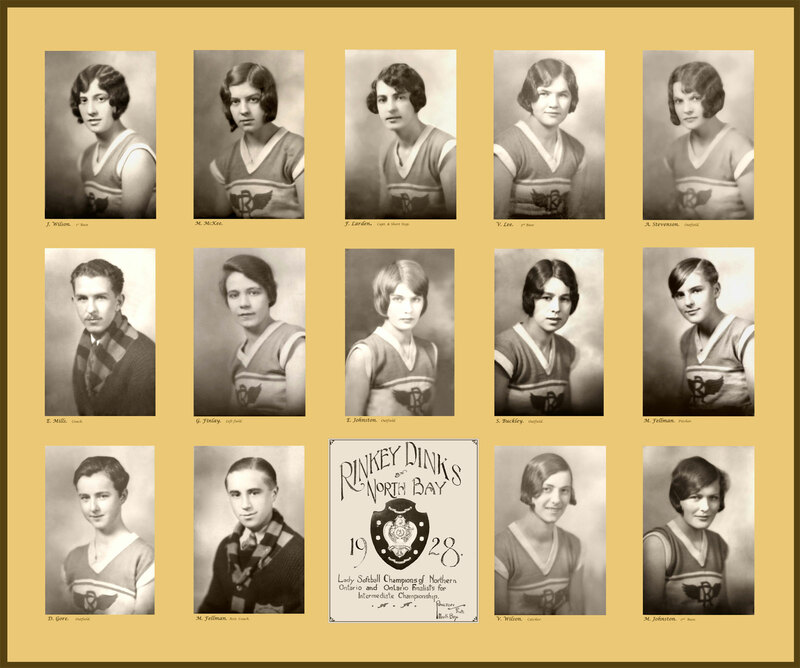 The original photograph of the Rinkey Dinks by Railton Photo in 1928 consisted of twelve individual images of the players and the two coaches, dry-mounted on a large mat with three rows of photographs with an image of hand-lettered text in the middle of the bottom row. The name and position of each player was lettered onto the mat below the image. It looked a lot like the restored image below. This composite photograph was later dismantled. The individual photographs were torn apart, remaining attached to the mat. At some point they must have been stored in a damp place and the photographs began to deteriorate. They all looked more or less like the photo of Dot Gore shown here on the right. Having done some photo restoration before, I thought it might be possible to restore these photographs at least to some extent. Once I had scanned them, I realized that the amount of work to be done was more than I had encountered before. I consulted photographer Mike de Moree and asked for advice as to how to best proceed. He worked on one image and showed me how it might be possible to make them look better although this would mean softening the focus considerably on the most damaged parts. Luckily the faces tended to be in better shape than the uniforms. After considerable effort and adding a sepia filter the images looked much better. The text, however, did not look great. The next problem was how to lay these out. For this I consulted with my husband who is very good at puzzles. We looked at the patterns of discoloration on the backs of the images and tried to fit them together to match. The restored images were then laid out as they would have been originally together with the text image. In the end I decided not to use the original text under each photograph, but to type in the same information with a similar font. For the final restored photograph a background colour was chosen similar to the original mat. A border was placed around it for viewing as a digital image. The final result is shown below. Rinkey Dinks of North Bay 1928 Lady Softball Champions of Northern Ontario and Ontario Finalists for Intermediate Championship. Photo by Railton Photo. Restoration by F. Noël. The original intention in undertaking this work (which took many hours) was to have a copy printed and placed in a public place like Memorial Gardens so that the Rinkey Dinks, the first team to bring home a provincial championship to North Bay (see previous post), be better remembered. A first attempt to do so failed because the file was too large. I believe that the new wide printer at Nipissing should be able to print this image full size and I am able to print a smaller version on my printer. Anyone wishing a print copy can therefore contact me. I would be particularly pleased to see it go up in a public venue. The portraits of the individual players are 4 inches by 6.1 inches in size. The shield and text is 5.4 by 6.6 inches in size. The full image is 28.8 inches by 24 inches in size and the file size for the full colour image as above is 255.87 MB. A black and white version is only 85.3 MB in size. The last living Rinkey Dink, Jean Wilson, died in North Bay in 2012. She is top left in this photo. 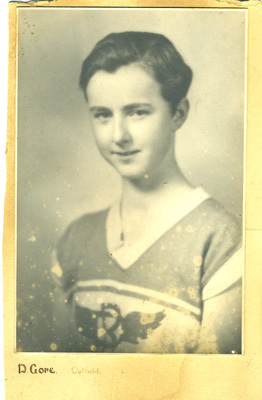 She did not play in 1929 when they won the championship because she had left the team to go to Normal School. She taught several generations of North Bay students who remember her fondly. She was 105 years old. Link to Jean Wilson’s obituary. Link to an image of Jean Wilson when she celebrated her 104th birthday. This entry was posted in Community History, Images, Sports and tagged image restoration, North Bay, Railton Photo, Rinkey Dinks, softball champions, sports history on January 22, 2013 by Françoise Noël. “Citizens Pay Tribute to Newly Crowned Ontario Softball Champions,” The Nugget, 29 October 1929, 12. CITIZENS PAY TRIBUTE TO NEWLY CROWNED ONTARIO SOFTBALL CHAMPIONS. THOUSANDS WITNESS PARADE IN HONOR OF ONTARIO CHAMPS. Memories of Old Home Week were revived on Saturday afternoon when the city was decorated in true celebration fashion and the citizens turned out in large numbers to participate in the civic tribute to the Rinkey Dinks in recognition of their spectacular achievement of winning the Intermediate girls softball title to bring the city its first provincial soft ball title. It was one of the greatest spectacles seen in the city in years and second only to the displays of Old Home Week in colour and magnitude. As early as one oʼclock an hour before the time the festivities were schedules to commence, Main street was thronged by a gleeful and expectant crowd. In the vicinity of St. Maryʼs Cathedral where the parade formed decorated cars were assembled on all the main and connecting streets anxiously awaiting the call into line. Promptly at 2 p.m. Parade Marshal James A Smith with three bands interspersed in a mile string of floats and decorated cars started the long and colourful file towards Main street. Fire Chief Brady led off with the fire truck second in line and followed by decorated cars bearing Mayor Banner and the city aldermen, city officials, executive members of the various softball organizations, officers of the various civic and service clubs, and others prominent in civic activities. Next came a string of floats conveying the members of the various city softball teams prominent in the line being the members of the Rinkey Dink team high up on a float […] in the team club colours of purple and white. Following came the Capitol T and N.O. and Kiltie bands at intervals in the parade and with these were a large number of decorated floats […] among which was an elaborate display bearing the name of the Board of Trade. Back of this spectacular array came an almost endless stream of decorated cars to stretch the parade to more than a mile in length. Following down Main street to Sherbrooke the Rinkey Dinks were heralded from all sides and this continued while the parade passed down Sherbrooke street to First avenue west to Ferguson street and on to Wallace Park where the ceremonies of the day took place. Accompanying the parade over the entire length were two motion picture cameras operated by representatives of the Associated Screen News under the direction of John H. Nelson, manager of the capitol theatre. Arriving at the park the members of the Rinkey Dink club players, coaches, manager and officials were paraded with the Collegiate and Sudbury rugby teams, the Collegiate Cadets, the Girl Guides, and three bands for the purpose of taking motion pictures. Following this the members of the victorious team were escorted to a decorated stand in the middle of the field where they were received by Mayor Banner, members of the city council, officials of the various civic organizations, and officers of the committee in charge of the reception. In paying testimony to the guests of the day on behalf of the citizens, Mayor Banner said in part. “This gathering and wonderful demonstration is to convey in some manner our appreciation to the Rinkey Dink Ladies Softball Club of the honor they have conferred on our city by bringing home the intermediate softball championship of the province and to congratulate them on their great victory over the Owen Sound team. This club composed entirely of North Bay girls has always been a factor in the championship race, having won both the local and Northern titles a number of times and last year were only beaten in the provincial championship by a lucky turn for their opponents. To say that any member of the team was directly responsible for the wonderful achievement of this year would be a mistake. The team play and co-ordination throughout the seasonʼs play is necessary to achieve victory. I hope this will be an inspiration to all other sports organizations of our city. “The victory of our girls over the Owen Sound representatives has in a great measure compensated the fans of North Bay for the defeat the Trappers sustained at the hands of the Owen Sound team in 1924. Evidently the girls took this very much to heart and when the opportunity came to retaliate they went out to win. “Again I thank the Rinkey Dinks for the great honor brought to the city and desire to assure them that the citizens are behind clean sport in all its branches. I hope this team, will remain intact and next year go out for the Dominion title. “On behalf of the Rinkey Dinks I desire to express to you their most heartfelt thanks for the wonderful reception you have given them and the many nice things that have been said about them today on their notable achievement in bringing to North Bay itʼs first club provincial championship, and now that the girls have broken the ice I only hope that many more championships of the same nature will come to North Bay in the various other lines of sport. The road to the championship has been no easy one for the Dinks for they have had to make many sacrifices during their quest for this coveted honor. “In looking around I see before me many good friends of the Rinkey Dinks who I know have helped them out in many ways during the past few seasons and those of you who have helped along from time to time since the club was first organized right to the present moment, the girls deem this a fitting occasion to express to you their sincere appreciation your many kindnesses on their behalf for great good will shows by all the fans present here today to the girls in their hour of victory greater still has been the loyalty shown to them by those who helped them out and cheered them along when every thing was not sunshine and roses for you have proven yourselves to have been friends in need indeed. To the Ontario Womenʼs Softball Association and to Miss Mabel Ray their secretary in particular the Rinkeys owe much and I am only sorry that Miss Ray could not be present with us today. This association generously gave the Rinkeys a bye last year so the Rinkeys could compete in the finals against the strong Oshawa and National teams and this year they gave Northern Ontario permission to form the Northern Ontario Ladies Softball Association of which our good friend Mrs. W. Larden is the first president. Miss Ray as some of you know was the first woman to put ladies softball in the province on an organized footing and from a small beginning ladies softball has increased by leaps and bounds until now hundreds of teams are affiliated with the parent body of the O W S A and right now ladies softball is on a very high plane. “The girls also desire to thank the press and particularly so The Nugget for the wonderful publicity they have so generously given in the interest of ladies softball. “As one who has traveled around the province with the Rinkeys during the past two seasons I want to state that at all times the girls have conducted themselves like real sportsmen and always remembered that they were out there representing North Bay. On the diamond they have always played the game and off the diamond they have been perfect ladies. They have made many friends for North Bay during the course of their journey. 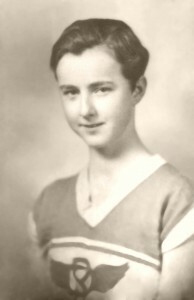 “Everywhere the girls went in Orillia, Oshawa, Toronto, Hamilton, Cochrane, Owen Sound, and other centres, you could hear it said what a wonderful bunch of girls the North Bay Rinkeys were and I venture to say that North Bay could not have chosen a better bunch of good will ambassadors for the occasion than the same Rinkeys. “In addition I just want in mention one incident that occurred that will show you the courageous make up of the player in question a makeup that is typical of every member of the team. Shortly after “Jackie Fellmanʼs” accident at Chalk River the girls called at Jackieʼs home to see how she was progressing and although “Jackie” was suffering intense pain at the time they found her singing the following words of a popular song. Representing the Ontario Womenʼs Softball Association Mrs W Larden president of the N O W A S presented the intermediate trophy to the team at the same time congratulating them on behalf of the provincial and Northern Ontario Associations. Mrs Larden took occasion to commend the various units of the N O W S A for their activities this season, particularly the North Bay city league and expressed the hope that next year would bring about greater achievements. Individual awards of medals were then presented to the following by Mrs Larden. Mary Mckee, V. Wilson, M Fellman, Sybil Carr, Zita McManus, Frances Larden, Vada Lee, Eleanor Johnston, Greta Finlay, Gwen Edwards, Sadie Buckley, Flo Johnston, Dot Gore, and Margaret Johnston. Wib Harris Mort Fellman and Fred Ball who were associated in coaching the team were introduced to the gathering. In accepting the trophy award Frances Larden, team captain said the members of the team, were grateful to the people for their support during the season and more particularly for the reception and tribute tendered them on the occasion of their winning the championship. Senator Gideon Robertson, J H McDonald president of the Board of Trade and H Morel also delivered addresses commending the girls on their worthy achievement. Congratulatory messages and letters were read by Mayor Banner from the following, Freda McGill, captain of the Owen Sound team, Charles Robinson, coach of the Owen Sound ladies, Miss Mabel Ray, secretary of the Ontario Womenʼs Softball Association, Mayor Bibby, Sudbury, W J DʼAlesandro, Toronto, Mrs. W J DʼAlesandro, president of the Ontario Womenʼs Softball Association, and Miss Tony Conacher, captain of the Canadian Ladies Softball Club, Toronto. Preceding the program the Capitol band rendered O Canada and at the conclusion the T and N O band played God Save the King. During the course of the program motion pictures were taken of the entire proceedings by two cameramen. These pictures will be shown in the capitol centre at a midnight show Friday and again Saturday afternoon.